Many years ago, 9-year-old Gary Dausch sat on the sofa with his grandmother, flipping through the pages of a picture book, when something captured his attention. A photo of a truck covered in lettering drew him in, and his grandmother noticed his interest. “That’s Uncle Cannonball’s truck,” she told him. And as quickly as that, Gary’s passion was born. “Cannonball” was a nickname Gary’s great-uncle, Erwin Baker, earned during his days racing motorcycles and cars, both locally and across the country. His most famous win came in 1909 at the Indianapolis Motor Speedway: Cannonball Baker won the very first race held at the most famous racetrack in the world. Later, Baker would be hired to travel across the country to promote motorcycles and cars by Indian, Stutz, Duesenberg and others. That moment on the couch was the beginning of a personal passion and accomplished career for Gary. As years passed, he began racing himself. He became interested in how cars worked. He restored cars for fun. And he began paying attention to how a product’s typography and design worked together to motivate people to buy. After studying art and education in college and beginning his career, Gary became fascinated with the marketing behind the racing industry. On a whim, he contacted racing team owner Derrick Walker, looking for an opportunity to merge his passions for racing and marketing. Six months later, while planning a business move to Indianapolis, Walker returned his call. The two would work together for the next 15 years. As marketing director for Walker Racing, Gary designed everything from sales materials to uniforms to race cars to business partnerships between car sponsors. One of only a handful of race team marketers in the country who was doing both the business and art portions of the job, with equal talent and success, Gary was putting in long hours. And while he loved his job, his personal projects were put on hold — until he was able to move into retirement in 2008. 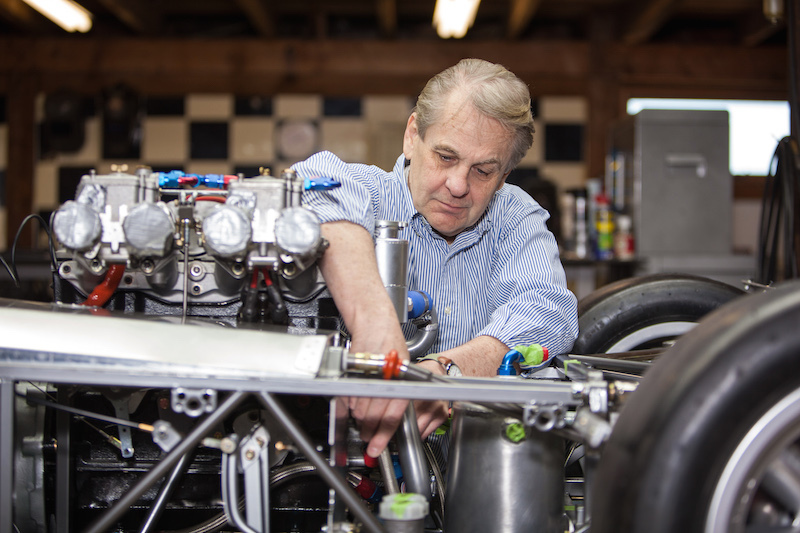 “Immediately, I went into building race cars,” says Gary. By doing so, he increased his appreciation for the details of car design. He knew which kinds of fittings, screws, rivets and other small pieces were used in which areas and for what reason. He knew which parts were carbon fiber, which ones were ceramic-coated and which ones changed color when the car became heated during racing. 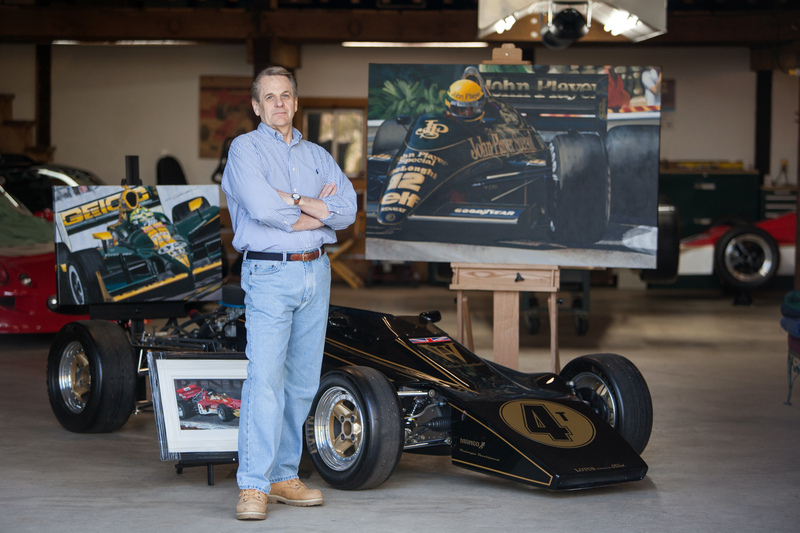 With his creative passion always on his mind, Gary again brought art and racing together, this time by crafting detailed, high-quality paintings of the cars with which he had been working for years. His first painting was meant to be a personal way to remember his pre-retirement work with and love of the racing industry, specifically cars that he had designed as part of his work with Walker Racing. But it attracted the attention of others in the industry, who wanted copies for themselves, and a new artistic passion (and side business) was born. Gary doesn’t describe his work as a business. (“It’s an active hobby that is intense and maybe a little bit out of control,” he says.) But word-of-mouth has sparked a modest following for his paintings. Each one requires between 150 and 200 hours to complete, and all include intricate details familiar, perhaps, only to those who have built, designed, raced or maintained the cars themselves. “That’s part of the magic, I think, in what I’m doing,” says Gary. “I’ve actually touched these parts, and I want them to look real. It’s kind of like I am building the car” as he paints, he says. 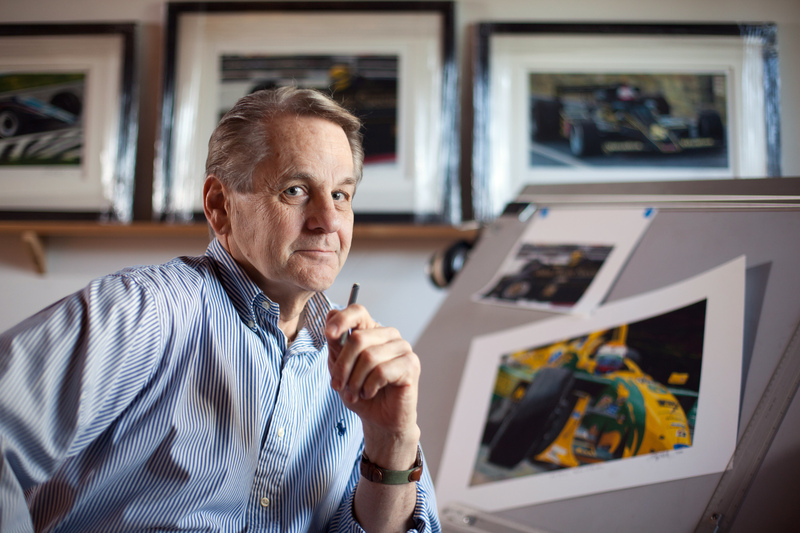 Today, his work hangs in the homes and offices of some of the racing industry’s most well known individuals, including drivers and team owners. Limited- edition prints (about 50 of each painting) make his art more affordable for a wider audience. “I’ve been blessed to take my mechanical interests and my art interests and put them together to do something I love to do”.